I find it most difficult and awkward to make comment on films that I personally do not like. That is why I could talk for days about this wonderful Oscar Submission! Children Of Heaven is one of those rare films that not only I want to talk about, but everyone else who has seen it seems to be raving about. This tender and triumphant little jewel of a film had every head turning at the recent 1999 Nortel Palm Springs International Film Festival, January 7th-18th. After it's first showing at the festival, people were indeed talking! "Did you see that film from Iran?" "No, any good?" "Just wait, go see it, we'll talk later!" 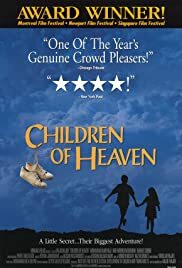 The Children Of Heaven follows the relationship between an impoverished brother and sister, Ali and Zahra, who are thrust into a difficult circumstance all revolving around a pair of sneakers. How they choose to solve their problem themselves, without telling their parents, is what makes the story so heart-warming and unique. What follows is a tender, moving tale of compassion, determination, and deep family love. 84 of 90 people found this review helpful. Was this review helpful to you?